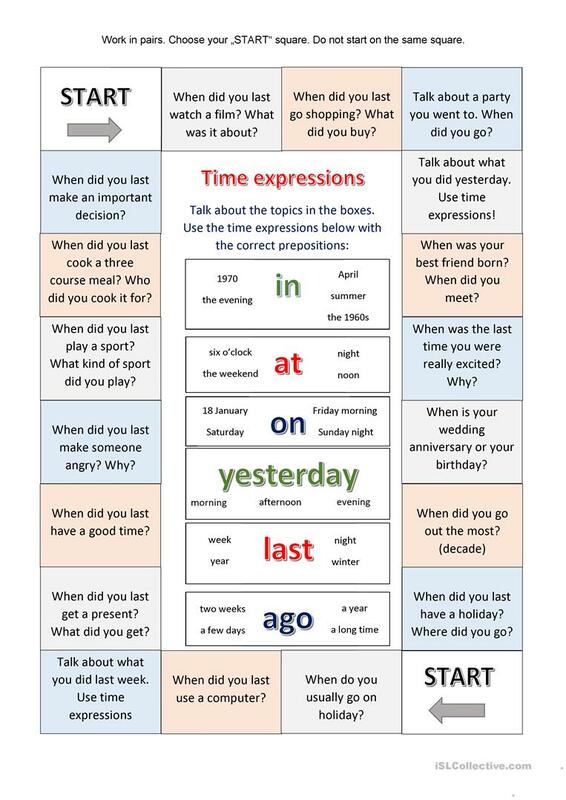 Boardgame to practise some time expressions as well as some prepositions of time. Students work in pairs. Each student starts the game on a different "Start" square. They move forward by one square at a time. Then they talk about the topic using one (or more) of the time expressions. E.g. "When was your best friend Born"? - "She was born on the 14th of February in 1995". The above downloadable worksheet is meant for high school students and adults at Pre-intermediate (A2) and Intermediate (B1) level. It is aimed at teaching Prepositions of time in English, and is excellent for working on your class' Speaking skills.